Dividend kings are companies that have raised their dividend for at least 50 consecutive years. Dividend kings have survived periods of inflation, oil booms, technology busts, rising interest rates, economic recessions, terrorist attacks, market crashes, evolving consumer tastes, major technology advancements, and more. Any business that has made it through every environment imaginable while maintaining regular dividend increases is worth analyzing. You can download the complete list of Dividend Kings with their up-to-date dividend yields by clicking here. Dividend kings are outstanding businesses that have demonstrated durability, consistent free cash flow generation, stable returns on capital, and (of course) predictable dividend growth. While there are over 50 stocks in the S&P Dividend Aristocrats Index, which includes companies in the S&P 500 Index that have raised their dividend for at least 25 consecutive years, there are fewer than 30 dividend kings. The latest companies to join the dividend kings list in 2017 were Stepan Company (SCL), Stanley Black & Decker (SWK), SJW Group (SJW), California Water Service (CWT), and Federal Realty Investment Trust (FRT). Commerce Bancshares was crowned in 2018.
Dividend growth investors seeking safe, growing income would be wise to familiarize themselves with the list of dividend kings. Companies that share characteristics with the dividend kings will likely go on to be some of the best performing stocks and most consistent sources of dividend growth over the coming decades. Imagine you had $200,000 to invest at the beginning of 1991. Suppose you put half into the S&P 500 Index and invested the other $100,000 equally across each of the current dividend kings that trade on the major stock exchanges (FMCB trades over-the-counter and was excluded for liquidity purposes). After making your initial investment in each of the dividend kings, you reinvested dividends but did nothing else – no rebalancing, no additional capital contributions. You simply bought and forgot. From 1991 through 2017, your $100,000 in the S&P 500 Index would have compounded at a 10.2% annual rate and grown to nearly $1.4 million at the end of 2017. Not bad at all! But what about your portfolio of dividend kings? There is some survivorship bias to this study (i.e. 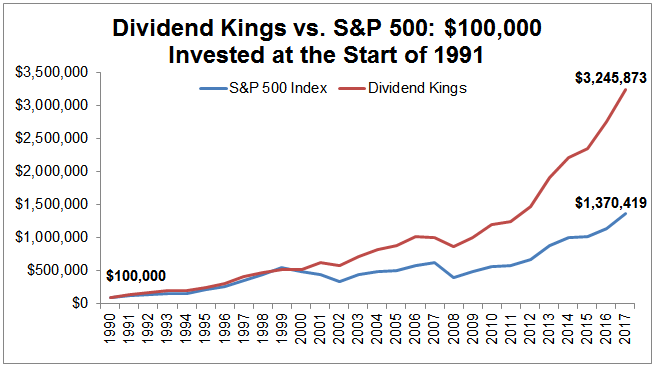 it doesn’t account for dividend kings that ultimately lost their crowns), but the dividend kings portfolio grew from $100,000 in 1991 to reach a value of $3.2 million at the end of 2017, representing a 13.8% annual return. Even better, the portfolio of dividend kings had annual volatility of 12.5%, much lower than the S&P 500’s 17.3% volatility during that 27-year period. Lower volatility means that the value of your dividend kings portfolio would have fluctuated less than the value of your portfolio holding the S&P 500 Index. 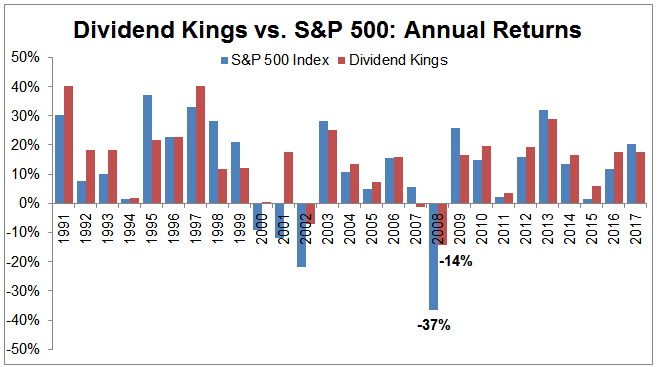 As seen below, the dividend kings significantly outperformed each of the four years that the S&P 500 Index (represented by the blue lines) declined in value. The dividend kings portfolio returned -14% during 2008, for example, easily beating the S&P 500’s total return of -37%. Dividend kings are generally high quality businesses with defensive characteristics that serve them well during bear markets. Of course, the performance data above contains a good deal of hindsight bias. After all, who can predict which of the current dividend kings will be able to continue increasing their dividends for the next 25 years? However, the information does illustrate the correlation between companies that are able to consistently raise their dividends and the value they create for shareholders. The best dividend kings from 1991 through 2017 were Lowe’s (LOW), Lancaster (LANC), and Parker-Hannifin (PH). These stocks generated annualized returns of 20.7%, 16.7%, and 15.4%, respectively. Impressively, each of these dividend kings still maintains a payout ratio near 50% or less, leaving plenty of room for them to continue increasing their dividends for years to come. From 1991 through 2017, only two dividend kings meaningfully underperformed the S&P 500 – Vectren Corporation (VVC) and Tootsie Roll (TR). Vectren is a utility company that primarily provides energy delivery services to natural gas companies located throughout Indiana and Ohio. This dividend king’s stock compounded at an 8.8% annual rate from 1991 through 2017, trailing the S&P 500’s annual return by about 1.4% per year. Tootsie Roll manufactures a variety of candies, including Junior Mints, Dubble Bubble, and Blow Pop. The company’s stock returned 9.0% per year from 1991 through 2017, trailing the S&P 500 by approximately 1.2% annually. Tootsie Roll’s underperformance could be due to corporate governance concerns as the Gordon family controls the company. All of the other dividend kings compounded faster than the market. The fastest growing dividend kings, as measured by annual sales growth over the last five years, are Federal Realty (FRT), Nordson (NDSN), SJW Group (SJW), Cincinnati Financial (CINF), and Lowe’s (LOW). Their sales have compounded at annual rates of 8%, 8%, 7%, 7%, and 5%, respectively. After more than 50 years of dividend growth in the bag, these growth rates are remarkable. Interestingly, only three of these dividend kings are also in the top four when ranked by fastest dividend growth over the last five years. Lowe’s (LOW), Hormel (HRL), Nordson (NDSN), and 3M Corporation (MMM) have compounded their dividends the fastest at annual rates of 20%, 18%, 17%, and 15%, respectively. Aside from 3M, none of these dividend kings had payout ratios greater than 50% as of 12/31/17, suggesting they have plenty of room for continued dividend growth. Analyzing where each of the dividend kings comes from can be quite insightful. 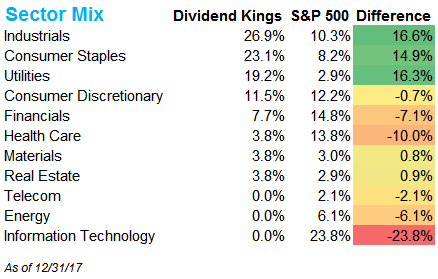 By equal-weighting each of the current 26 dividend kings, we were able to compose the sector mix of the dividend kings list and compare it to the S&P 500. As seen below, not a single technology stock is to be found in the list of dividend kings. The rapid pace of change and continuous need to invest for growth make consistent dividend payouts less common in this sector. Warren Buffett is notorious for largely avoiding the technology sector because he is uncomfortable forecasting the industry’s dynamics several years out given its rapid pace of change. The industrials, consumer staples, and utilities sectors are weighted much more heavily in the dividend kings list than they are in the S&P 500 Index. These sectors tend to evolve at a much slower pace, providing a more attractive environment for long-term dividend growth. Just because a company has increased its dividend for at least 50 consecutive years to qualify as a dividend king does not mean it is an attractive investment opportunity. With at least 50 consecutive years of dividend increases, dividend kings have already proven their durability. However, the world is constantly evolving. An industry that was slow-moving over the last decade could experience much faster change over the next 10 years as technology advances, consumer preferences evolve, markets become saturated, and new competitive threats emerge. We like to start our evaluation of the dividend kings by reading more about their businesses and asking ourselves how the world’s changing forces could challenge them. Essentially, what is changing that could make the next 50 years much more difficult for this industry or company? If we are comfortable with the company’s competitive advantages and the forces shaping its industry, we can begin to analyze its financials. Simply put, we want to invest in businesses that earn high returns on invested capital (e.g. over 10%), have numerous growth opportunities to keep earnings moving higher (earnings drive long-term dividend growth), and maintain conservative balance sheets (e.g. debt-to-capital ratio less than 50% for most business models). A lower payout ratio (e.g. below 60%) is also preferable. Many dividend kings possess these characteristics, which makes valuation the more challenging factor in most cases. Even the best businesses can reach such high prices that your future returns will be disappointing regardless of the company’s fundamental performance. The best time to buy dividend kings are when their stock prices get hit by temporary factors that do not impede their long-term earnings power. Such occurrences are unusual but worth waiting for. Otherwise, as a general rule of thumb, we prefer to pay no more than 20 times earnings for most businesses. A margin of safety is always desirable. We analyzed the business models, dividend safety, dividend growth, key risks, and more of the dividend kings below.